Gaggan, voted best the restaurant in Asia, will leave you Gagging for more ! 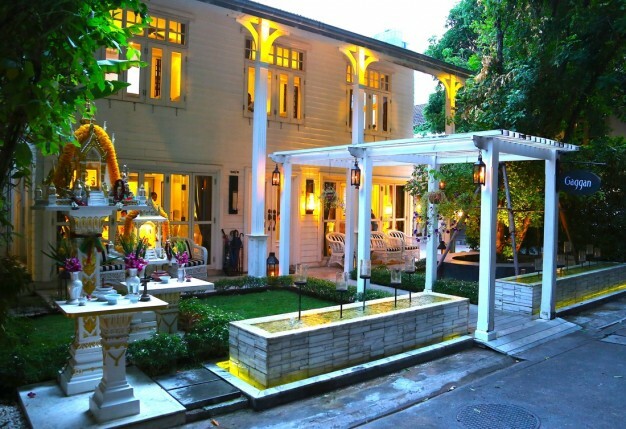 I was not surprised to read that one of my favorite restaurants in Bangkok: Gaggan had been awarded the “Top Spot”, coming first in “Asia’s Top 50 Restaurants” list and voted 10th best restaurant in the whole world at the “San Pellegrino World’s Best Restaurant Awards” held in London earlier this year. 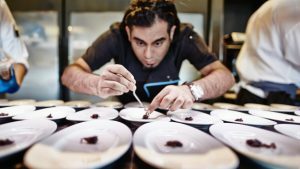 The 37 year old owner and head chef: Gaggan Anand who trained at the famous Ferran Adria’s Michelin star restaurant El Bulli in Spain, has created a work space that can only be described as more of a science lab than a kitchen. Molecular cooking is the name of the game at this restaurant. With 22 chefs and 18 “front of house” hosting a maximum of 60 covers per night and creating what I like to describe as “Showtime Theater”, there are so many twists & surprises, you simply cannot describe your evening here as just “Going out for dinner”. Definitely not the norm, this restaurant should be enjoyed with friends “who love food” or “foodies” as we like to be called and certainly reserved for special occasions. Living in Bangkok or Pattaya how lucky we are to have the best restaurant in Asia (10th in the entire world) right here on our doorstep and you don’t even have to be a fan of Indian food to eat here. This is not your “Chicken Madras and five pints of lager joint” the chefs are constantly changing the menu to ensure you are always surprised by their newest creations. The restaurant itself is very cozy in what I would describe as “quaint wooden Thai house style” with a colonial feel and the option of dining upstairs or downstairs. The bright and cheery atmosphere is important, as you really eat with your eyes first in this establishment. OK now to the food, we all opted for the 17 course tasting menu – don’t worry the portions are small but its crazy to think some dishes take 24 hours to prepare and are gone in just 60 seconds! We started with a trio of taste ticklers (amuse bouche) consisting of white chocolate balls filled with cilantro and other herbs and spices, then covered with silver leaf and a scientifically recreated “egg” using yogurt. A twist on the egg on a spoon idea -maybe this was a childhood memory for Gaggan from his school sports day? The following dish was a real show stopper, an edible “plastic bag” of nuts made with translucent rice paper.Trying to convince your Thai partner that it’s safe to eat a plastic bag can be a little difficult. However once tried they are game for any other oddities to follow, such as the deconstructed Bhajis that resemble a bird nest or the Foie Gras hot dogs, where the bread is made entirely from onion powder which just melts in your mouth in seconds, leaving you with a mouth full of smooth, silky pâté. The cocktails should also be mentioned at this stage, The Mango cocktail is simply To die For containing large chunks of mango served from a tall smoking glass which looks as if it has come straight from a mad scientist’s laboratory. As does the coconut concoction they also served, sorry I forget the exact names of this cocktails but I did have a few – the service staff were very attentive! If you are lucky enough to be served by the hilarious Khun Ae (ask for him by name) you’re certainly in for a night to remember. Last but not least my favorite cocktail “The Drunk Samurai” a potent blend of Japanese liqueurs and Sake but be warned, it comes in sorbet form with Ikura (salmon roe) and Japanese pepper. Back to the food and next we enjoyed a simple dish of extremely fresh oysters and wasabi. That certainly woke up the taste buds ! This was no doubt to prepare us for what followed: the best soup I have ever tasted, consisting of an egg yolk cooked at precisely 62 centigrade, asparagus, morels and artichokes, finished with a slice of truffle and chili air, and if that wasn’t enough it was served ina real stone rock. In fact all seventeen courses were presented on an array of different plates varying from little baskets, rocks, spoons and what only can be described as a miniature version of the kind of scales street vendors use to carry their wares around Bangkok. Attention to detail in this restaurant is a feast for the eyes and makes the whole dining experience completely memorable. Another favorite of mine was the lamb sliders, OMG I never knew burgers could be so delicious, if they opened a fast food chain serving these sliders all the major fast food chains would go out of business in no time. These were presented on the street vendors scales previously mentioned. Obviously with seventeen courses and nearly as many cocktails, I cannot describe all the dishes, flavors and ingredients, but there was a particularly lovely fish with Indian mustard powder that I was very impressed with, a dish of “Iberian pork belly” and a lamb chop covered with a glass pleasure dome that once removed released a most delightful aroma. “Her indoors”/the wife cannot and will not eat any lamb so instead the kitchen prepared for her a Tandoori king prawn which was also very good – I know because I stole a little taster! Now it was time for dessert. Yes you’ve guessed it this was no simple affair consisting of three dessert courses but again, do not worry they are not big portions, more little tasters. We started with the delightfully named “Poor Man’s Porridge” which was a concoction of Jasmine rice ice- cream and pistachio crisps, finished off with a dose of rose room freshener. Sounds strange and I suppose it was a bit but it reminded me of my dear old mother’s rice pudding back in the UK when I was a youngster. Then a dessert with a dash of Indian flare, “Masala Chai”, an ice sorbet of saffron and cardamom, a great combination of flavors that also cleansed the palate for the finale. Simply named “The Magnum” and served by a chef at the table on a chopping board, this is just an explosion of different kinds of chocolate flavors, temperatures and textures -no doubt inspired by the famous ice cream of the same name. Undoubtedly, more than enough chocolate to keep any “Chocoholic” happy. All in all, I can honestly say that this was one of my most memorable dining experiences ever. I really cannot recommend visiting this restaurant highly enough, so much so that when people ask me what is on my bucket list I say going on holiday to the Maldives and having dinner at Gaggan – these two things, in my opinion should be done at least once in one’s lifetime.